LUTZ -- When Rev. Matthew Hartsfield, lead pastor at Van Dyke Church, and Rev. Jorge Acevedo, lead pastor at Grace Church, Cape Coral, were planning for Real Ideas 2015, they wanted to be certain the conference conveyed “what the power of the gospel was all about,” Acevedo said. To help make sure that happened, they invited Acevedo’s old friend, Rev. Dennis Blackwell, senior pastor of Asbury UMC in Woodlynne, N.J.
Rev. 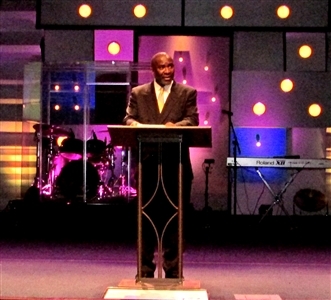 Dennis Blackwell tells a crowd of about 350 that "the gospel has the stuff that frees us from our sin and shame" during the opening presentation of Real Ideas 2015. Photos by B.C. Manion. During the opening keynote address at the annual two-day conference at Van Dyke, Blackwell delivered. He talked about the power and authority of the gospel. He posed provocative questions. He reminded the audience of the gospel’s unfailing message of redemption and salvation. “The gospel that I teach and preach has the power to transform lives. The gospel that we have is not something that was engineered in some laboratory. The gospel that we have is something that was created by God,” Blackwell said. “I wonder if we’ve become so one with the culture in which we live and the culture which we preach to that we have lost our evangelical fervor, our unbridled zeal to proclaim our message as boldly, as unashamedly, as those of other faiths do. “Unfortunately, beloved, the lack of church’s influence on society, the condition of our culture, the destruction of our family, the corruption of government, the senseless murders of unarmed men and women in our streets leads one to wonder … if the church has conceded the fight,” said Blackwell, whose church was designated 15 years ago as a Congregational Resource Center for Strengthening the Black Church for the 21st Century. Carol Allison, a UMC pastor from Greenville, S.C., and a three-year Real Ideas attendee, likes the workshops at the annual event. Even 2,000 years after Jesus was buried, resurrected and ascended, the gospel “still has the power to take a slave and make him free, to take somebody stingy and make them generous,” Blackwell said. “It still has the power to do what God promised to do. That’s why every Sunday morning, I can’t wait to tell this story,” said Blackwell, kicking off a conference that featured six keynote speakers and more than 50 workshops. About 350 people registered for the conference, with approximately 200 of those taking advantage of extra sessions held in a preconference Thursday morning. The event, now in its ninth year, draws primarily from Florida but also had cars in the parking lot from places such as Indiana, Tennessee, Texas, Kentucky, Georgia and North Carolina. 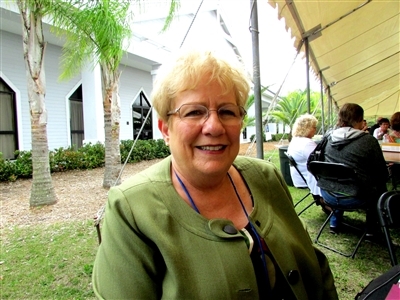 Carol Allison, pastor at Trinity UMC in Greenville, S.C., has attended the conference three years in a row. “I enjoy the workshops. They’re good,” Allison said. This year, she was particularly interested in a workshop called “The Church that Prays” because she’s initiating a prayer ministry at her church. Kim Stralow from Havana, a small town about 10 miles away from Tallahassee, was at the conference with two others from Salem UMC. They planned to fan out and attend different workshops so they could make the most of the conference. Betsy Priest, a Van Dyke volunteer, said she thinks the conference helps churches address genuine needs. “There are so many churches out there that are barely getting by,” she said. 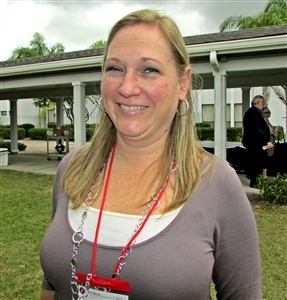 Kim Stralow of Salem UMC, Havana, in northwest Florida is among attendees from several states at the ninth annual Real Ideas Conference. Patty Smith delivered a preconference session called “Why Nobody Volunteers in Church,” loaded with practical advice on what to do about it. There’s an art to attracting and retaining volunteers, Smith said. It’s important to connect personally with volunteers, provide training and know how to delegate -- not dump -- duties, Smith said. “We cannot micromanage people. When we delegate, we give people a sense of autonomy,” Smith said. Make training convenient to boost attendance, she advised. Listen to volunteers, Smith continued. Give them a chance to offer feedback and be willing to accept criticism, she said. While it’s painful to hear negative feedback, it often has at least some truth in it. Some speakers focused on practical ways to get things done. Others touched on the need to address the personal and spiritual needs of church leaders and volunteers. He emphasized the need to take time off. “We can’t keep adding things to our full lives and schedules without purposely subtracting something,” he said. If people don’t make those choices, he added, something will end up subtracting itself – and it’s unlikely to be the least important thing on the schedule.